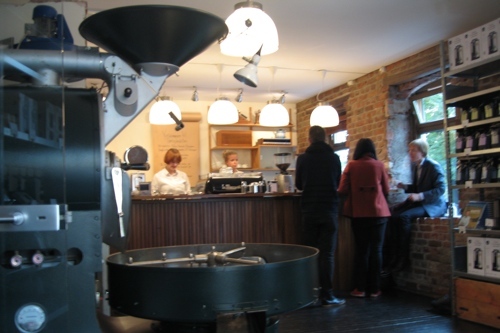 Located in what is described as "Oslo, Norway's Greenwich Village", Grünerløkka, is Tim Wendelboe's Coffee Roastery. Unless your name is Keaton you might not recognize Wendelboe's name, but for coffee snobs he has high standings, winning the World Barista Championship in 2004, and is genrerally considered one of the world's foremost baristas. Thus we had to try the man's coffee shop at our recent Oslo visit: One, to try some exceptional coffee, and two, to rub it in Keaton's face. Somewhat miraculously, prices are comprable to American coffee shops. Not bad, seeing Oslo is among the most expensive cities in the world. Lately there have been some talk in Norwegian media about snobbery amongst "upscale" coffee houses like Wendelboe. We can see what they're talking about, kind of. Sort of. Go in and order a couple of cappuccinos and you're fine; the service was quick and friendly, and we had our coffee within five-ten minutes. Go in and order an iced coffee in October, which we witnessed somebody attempt, and you'll be met with that famously stoic Norwegian passive aggressiveness, and receive a short explanation delivered with a stiff smile about why they don't have iced coffee when it's cold outside. Really, watch the "Soup Nazi" episode of Seinfeld and you'll know what to do here. Order from the menu without attempting smalltalk and you'll be fine. Wendelboe got its reputation for a reason. This is exceptionally good coffee. Set aside some time to visit Grünerløkka and this coffee house should you visit Oslo. Buy some beans, drink some coffee. Wendelboe isa Mecca for any Better Taster. Do you recommend Tim Wendelboe Coffee Roastery? Make your voice heard!